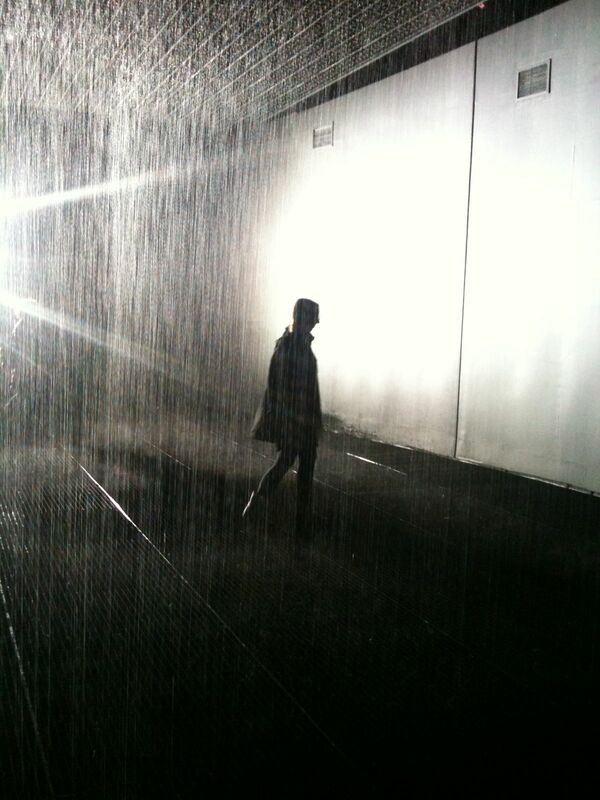 Last Thursday night I went to the Rain Room at the Barbican Centre. An interactive display where you have to put your faith in the art to keep you dry as you walk through a room of rain. They only let five to ten people into the display at any one time which leads to long queues. Two hours isn't unusual and I had to wait for an hour and a half for my turn to (hopefully) not get wet. The newspaper and a chat to my friend Kren made the first hour pass pretty quickly, but the final twenty minutes definitely began to grate. The long wait over and I was into the room! As I approached I could see people already in the display successfully keeping dry, so I didn't really fear getting wet. The geek in my just wanted to know how it worked. Four sensors down each side and a bright light at one end illuminating the room help identify where you are. The installation then creates a dry circle above your head around a meter and a half in diameter. As long as you walk slowly it worked really well, with only a couple of drips landing on me. It was fun for a while, but then I had the 'what next?' feeling. The sensors clearly weren't reactive enough for you to try running through the rain, or otherwise play around, and stay dry at the same time. The rain room was a bit of fun, but I don't think it was worth such a long wait. A half hour wait would be my maximum if I was to visit again I reckon. The art work might have been a slight disappointment, but dinner at the Barbican Lounge afterwards certainly wasn't. I wasn't expecting too much, but the tapas menu was really good. With their special offer we tried virtually everything on the menu and all of the dishes had a great flavour. The Barbican isn't too far from my office so it is definitely worth remembering as an alternative place to visit for lunch.